Grooming Great Pyrenees can be a lot of work. Their coats are thick and even though they only blow their coats twice a year, they shed all. year. long. The Oster Grooming Rake is hands down my absolute favorite tool for grooming Great Pyrenees. I’ve tried so many rakes, and this one gets deep into the undercoat without cutting the fur. My only complaint about the Oster Grooming Rake is that the handle isn’t very comfortable. However, I just wrapped some electrical tape around the handle and it made all the difference! I get asked a lot about using a Furminator on a Great Pyrenees or breed with a similar coat. My advice is always no. Every time I have used it on a pyr, it has cut and damaged their fur. 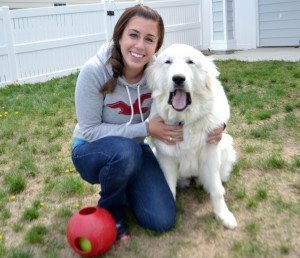 Related: Great Pyrenees: Myth or Fact? I get a LOT of questions about how I keep the fluffies so white. The majority of that is their self-cleaning coats, but The Stuff is my other weapon. Use it wet or use it dry–The Stuff helps repel dirt, add shine and silkiness, and remove mats and tangles. Mauja, Atka, and Kiska all have slightly different coat types, and this works great for all of them. Plus, they have extremely sensitive skin and Kiska is allergic to EVERYTHING, and this doesn’t bother them at all. Yes, a real dremel–not a pet dremel. I couldn’t even get Kiska’s five-month puppy nails shortened with the pet dremel I picked up. If your dog is new to the dremel, take it slow. I prefer it because I don’t worry about them flinching and knicking their quicks. It can also help slowly push the quick back if it has gotten too long. I always keep styptic powder on hand, just in case I get the quick. There are plenty of great slicker brushes out there, but the Hertzko Self Cleaning Slicker Brush is my favorite for grooming Great Pyrenees. After raking out the undercoat, I like to use a slicker brush to get any remaining loose fur and smooth the coat. I particularly like this one because it’s “self-cleaning”. With a simple push of a button, the bristles retract, making it easy to remove the fur. It also has a very comfortable ergonomic handle. I tried my hardest to trim their grinch feet with grooming scissors and I failed every time. Their feet always looked like they had bowl cuts. Not cute. The Oster A5 Animal Grooming Clipper is a great tool to nix the grinch feet without leaving a horrible haircut. Let’s face it–even the best-groomed animals can develop a mat here or there. Last time Mauja had a UTI, she developed one “down there”, and these clippers were helpful in safely removing it. I could have included several other tools I use for grooming Great Pyrenees, but these are the basic five I use weekly, if not daily. Happy grooming! Do you have a must-have grooming tool that isn’t on this list? Tell us in the comments below! What do you do to keep their skin healthy? My 2 1/2 year old Malika has hot spots, despite good grooming, baking soda and otmeal soothing baths, cool spots to lie down in, and several courses of antibiotics from the vet. They come and go, but right now are particularly bothersome. Have you thought about changing your food? I have had 2 dogs with wheat and corn allergy. They had horrible hot spots until I figured this out. Best of luck to you. What tip do you suggest using on a Great Pyrenees? Thank you so much. As a new owner I’m relying on the kindness of strangers to help guide me. I’m learning a lot Ana and am very appreciative for any advice I get. We are new parents to a Pyrenees mix and I appreciate any and all suggestions too! What kind of attachment do you use with the Dremel for their nails? I had never thought of using a Dremel (great idea for sure! ), but wouldn’t want to use something too harsh. I’m dying to know this as well! This diamond coated dremel attachment is an absolute MUST for any dogs with nails thicker than toothpicks! This dremel attachment won’t get hot as quickly like the sandpaper heads so you can dremel longer, and they last forever (I’ve been using the same one on 4 dogs for 6 years). I accidentally used a ferminator on my great pyr mix (just once!) before reading this post and now am worried I’ve damaged my dog’s coat forever. Is there a way to care for the coats as they grow back? Can anyone speak to this?